Never tried Pilates before? Sign Up for our Trial Class Today! 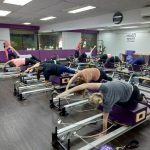 [titled_box title=”Pilates Newbie”] 15 Reformer Group Classes at $735 (usual price: $975). [/titled_box] [titled_box title=”Pilates Junkie”] Enjoy 100 Reformer Group Classes at $4,050 (usual price $6,500). Socks are compulsory for every class. Class cancellation must be made 12 hours before class and no-show is charged. You will not be able to attend the class if you are more than 10 minutes late and class is charged. Check out the Pilates Classes Schedule now!